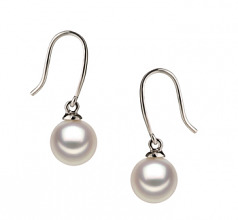 A simple yet elegant and graceful set of White Japanese Akoya Pearl and Sterling Silver Earrings are always a welcomed gift for the woman who loves pearls. 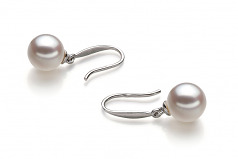 At 7-8mm in size these medium White Pearls have a near AAA perfect shape and AAA mirror image luster. The shimmering luster can be seen covering the surface of the pearl in glistening detail right up to where the .925 Sterling silver begins to take hold. The Sterling silver fishhook style posts allow the earring some degree of length and classic elegance. The unique look and style adds a bit of old world charm as you mix and match these beautiful earrings with everything in your closet. From casual to formal, you will want these earrings by your side. Show only for "Yoko Earring Set"